Monday Night I was coaching at my CrossFit box and checked my phone between classes. My wife had sent a text asking if she could open a package I’d received in the mail. She’d attached a picture, so I zoomed in on the return address: it was from Lisa Cheng, my editor at Running Press. I didn’t have time to reply, but I knew what my answer would have been: Absolutely not. I raced home to my wife and the package that she had propped on my pillows. “I wouldn’t have opened it. You know that,” she said. Bless her. 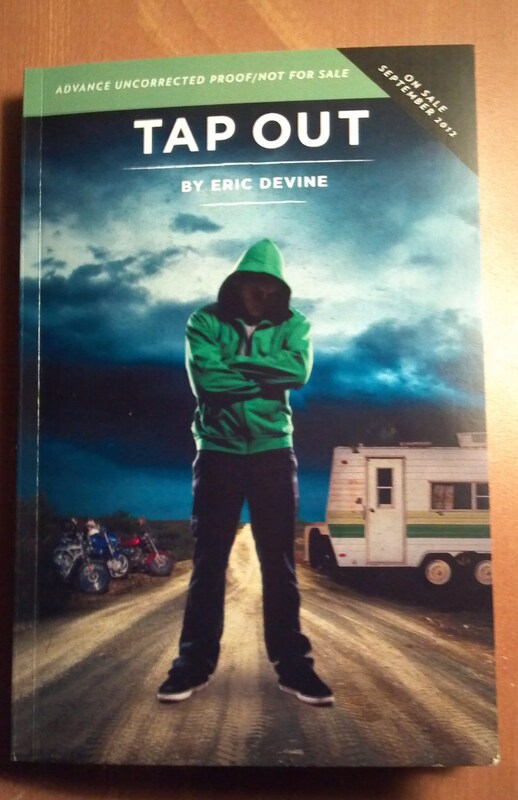 In that package were two copies of the Advanced Reader Copy of Tap Out. My wife and I turned the copies over, inspecting like children with new toys. A handwritten note from Lisa had come as well and my wife read it aloud. I was exhausted from my 15-hour day, but was lifted by the exhilaration of it all. My Work. In Print. Looking Awesome. Enough Said. Now, unlike my previous writing, my wife had not read one word of Tap Out. We’re quite superstitious, and after my first project with my agent Kate McKean didn’t sell, my wife decided she didn’t want to “curse” anything else. She dove into Tap Out and I got out of the room. I’d forgotten how uncomfortable it makes me to have her read my work. I don’t know why, except, possibly it’s because I don’t want to let her down. She’ll love me and my work regardless, but she might not actually enjoy the writing. That would hurt. I occupied myself for a half hour and then re-entered the bedroom. “So?” I asked. Mind you, I heard quite a few gasps and some throat clearing in the interim. The first chapter is quite the slap in the face. So a blase “So what?” didn’t fit. Fair enough. I occupied myself a while longer and finally my wife was ready. Soon the copies will be off for blurbs, and I hope that the authors who read them are a fraction as generous as my wife was with me. Congrats on the book! Michelle and I are looking forward to buying our own copies and sitting down to read once they are on sale! Thanks. I’m sure you will both enjoy it.